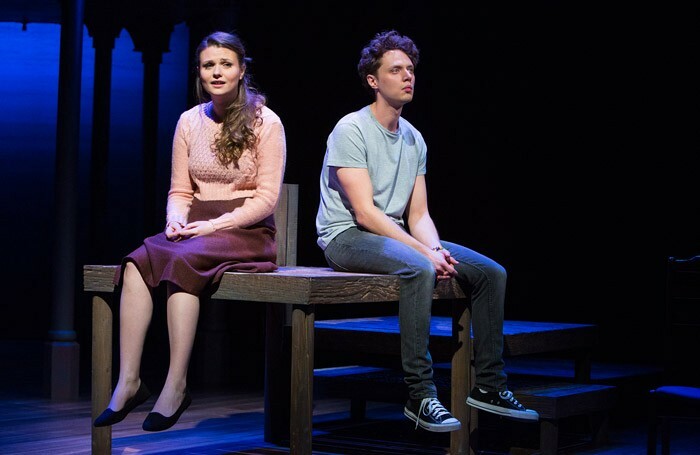 The New Wolsey Theatre’s first home-produced show in its 15th birthday season is a bewitching production of Jason Robert Brown’s contemporary classic. The Last Five Years is a song cycle which charts the course of a couple’s relationship. Katie Birtill and Chris Cowley create characters that live through the songs. The show starts at the end with Birtill\s Catherine coming to terms with the collapse of her marriage. In the next number her yet-to-be husband Jamie, a highly successful young novelist, is celebrating their first meeting. As Catherine’s narrative moves backwards in time, Jamie’s story moves forwards. Director Peter Rowe’s bold staging uses lighting and costume changes to steer the audience through the contradictory and potentially confusing time-lines. The two leads share the stage, an unspoken presence during the other’s songs; this gives both performers something to react against. Birtill and Cowley create two believable but flawed individuals, sympathetic but also frustrating – at times you want to bang their heads together. Their singing is both powerful and moving and is complemented by richly textured musical arrangements from Caroline Humphris’ five piece band featuring cello and violin. Designer James Perkins leaves the stage largely bare except for a wooden porch and a small jetty, and the production as a whole is confident and engagingly staged. Bewitching production of Jason Robert Brown’s contemporary song-cycle.